I got some beautiful nectarines at the produce shop this weekend and decided to use them in a summer salad. 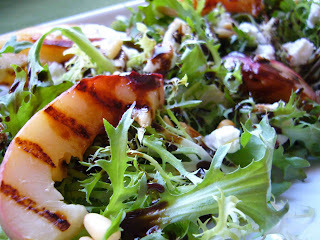 I grilled the slices of nectarines and dressed the salad with a sweet and tart balsamic vinaigrette. A good trick with balsamic is to reduce it down a little bit on the stove. This helps turn your everyday balsamic into something syrupy and wonderful, similar to the aged vinegar that costs big bucks for just a small bottle. Pour 4 - 5 T balsamic in a small saucepan and reduce down to 2 T. Slice nectarines and grill slices in a grill pan or over a BBQ. Toast pine nuts over dry heat and combine with the frisee and crumbled goat cheese. Once grill marks have developed on the nectarines, remove from the heat and let cool. To make the dressing, combine the balsamic with the honey, Dijon and goat cheese. Mixing a little bit of goat cheese into the dressing cuts the tartness of the vinegar and allows the sweetness of the reduced balsamic to really shine through. Once the dressing is made lay the nectarines out on the frisee and drizzle with the dressing. Enjoy!